The Cherry Grove section of North Myrtle Beach, South Carolina could be your home away from home if you make reservations today for Pier Watch Villas I 102. 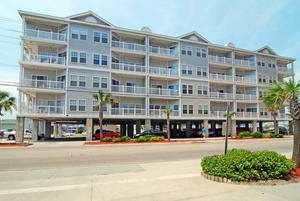 This fabulous oceanfront, North Myrtle Beach condominium rental is brimming with space, amenities and conveniences. Pier Watch Villas I 102 is a luxurious six-bedroom, five bath North Myrtle Beach condominium rental that lives like a house. The kitchen of this North Myrtle Beach vacation rental is nicely equipped with two refrigerators, a dishwasher, disposal and microwave. Serve meals at the adjacent dining table, then retreat to the living room at this oceanfront North Myrtle Beach condo for some relaxing conversation. Move out to the oceanfront balcony of this North Myrtle Beach vacation rental for impeccable views, coastal breezes and much-deserved rest. From this vantage point, take in the sights of the North Myrtle Beach, South Carolina shoreline and keep an eye on the beachfront activity and the hustle and bustle of the swimming pool and Jacuzzi at this oceanfront North Myrtle Beach resort. Back inside Pier Watch Villas I 102, soak up the sunlight that shines through all the windows. A game room inside your North Myrtle Beach vacation rental at Pier Watch Villas I 102 entertains guests with a pool table and the big-screen television in the living room is appreciated by the sports fans. Indulge in the private Jacuzzi tub that you will find in this North Myrtle Beach condo rental. Close to the exciting Pier Watch Villas I 102, a fishing pier invites fishing aficionados and novices alike. Main Street in North Myrtle Beach, South Carolina is a good destination for quaint shopping near beach music and shag dancing clubs. Live theaters dot the Myrtle Beach area landscape offering musical productions, dancing performances and Broadway series shows. About 100 Myrtle Beach golf courses vie for your attention, so be sure to set your tee times when you first arrive at Pier Watch Villas I 102. Save time during your North Myrtle Beach vacation to visit the water parks, miniature golf courses and outlet malls while you stay at this condo rental in North Myrtle Beach, South Carolina.